In compiling this booklist, I was thinking about why I find reading medieval mysteries so appealing. I think it’s the detailed settings and ways of life that are so different than life today, but with characters modern readers can relate to and revisit in further books in the series. Characterization, setting, and plot are all important in medieval mysteries, and all the books listed here are part of a series. Ash, Maureen. 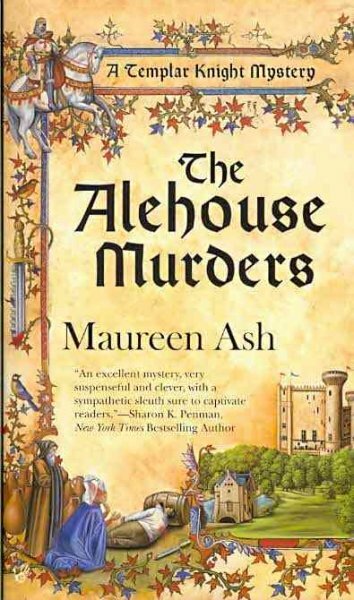 The Alehouse Murders introduces Knight Templar Bascot de Marins, recovering from injuries in Lincoln, England, and his young, mute servant, Gianni. Clare, Alys. Fortune Like the Moon begins the Hawkenlye series, with Helewise, Abbess of Hawkenlye and Josse d’Acquin, French knight. Clark, Cassandra. Hangman Blind introduces Abbess Hildegard. Franklin, Ariana. Mistress of the Art of Death begins the Adelia Aguilar series. Adelia is an Italian-trained medical examiner working for Henry II. Her Muslim bodyguard Mansur pretends to be the physician for Adelia. Frazer, Margaret. The Novice’s Tale is the first Sister Frevisse mystery, set at St. Frideswide Abbey in England. This is one of my favorite series, with excellent setting, story, and characters. Sister Frevisse gets to travel more than most medieval nuns, so there is also variety in the settings. There are 17 books so far. She has a related series as well. A Play of Isaac is the first book featuring Joliffe, an actor, playwright, and a spy. He travels with a small troupe of actors who are like a family, often struggling to make ends meet, but preferring travel to settling down in one place. Gellis, Roberta. A Mortal Bane introduces London madam Magdalene la Batarde and Sir Bellamy Itchen. Gordon, Alan. Thirteenth Night is the first Fool’s Guild mystery, featuring Theophilus or Feste, a jester and secret agent, and Viola, who becomes his wife and apprentice. The pair travel extensively, from Italy to Constantinople. Grace, C.L. A Shrine of Murders is the first book featuring Kathryn Swinbrooke, Canterbury physician. McIntosh, Pat. The Harper’s Quine is the first in the Gil Cunningham series. Gil is a young lawyer in Glasgow, who is assisted in his investigations by French mason Master Pierre and his daughter Alys. Strong female characters and vivid portrayal of village life add appeal. Newman, Sharan. Death Comes as Epiphany introduces Catherine LeVendeur, student of Heloise at the Paraclete in France and Edgar, her betrothed and student of Peter Abelard. Peters, Ellis. A Morbid Taste for Bones is the first in the classic twenty-one book Brother Cadfael series, set at a Benedictine Abbey in Shrewsbury, England, near the border of Wales. 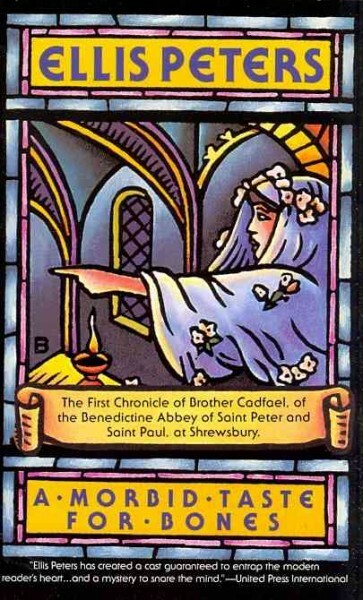 Brother Cadfael is a monk, herbalist, and former man at arms. Robb, Candace. The Apothecary Rose features soldier turned spy Owen Archer, and his wife Lucie, an apothecary in York. Roe, Caroline. A Remedy for Treason begins the Isaac of Girona series. Isaac is a blind Jewish physician in Spain. Sedley, Kate. Death and the Chapman begins the Roger the Chapman Tales. Roger is a peddler, traveling around England, which he enjoys more than life at home in Bristol with his mother-in-law and young child. Tremayne, Peter. Absolution by Murder is the first in the Sister Fidelma series. Fidelma is a dalaigh, or legal advocate, in 7th century Ireland, and is sister to Colgu, the King of Muman. She is assisted in her investigations by Brother Eadulf of Canterbury.